Philadelphia 76ers center Joel Embiid during the second half in game three of the first round of the 2018 NBA Playoffs against the Miami Heat at American Airlines Arena. 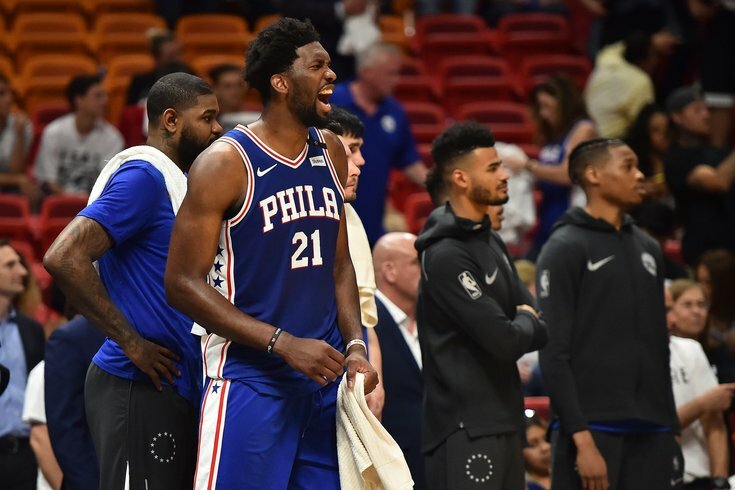 If a team assumes the identity of its top players, the best reflection of Joel Embiid and Ben Simmons' ownership of this team has been Philadelphia's demeanor during this road trip to Miami. This may be a group taking its first crack at the playoffs together, but the ease with which they have navigated their time here would make you believe they are a group of seasoned veterans. A victory in Game 3 certainly helped, but the Sixers came off as calm and collected even before their pivotal win on Thursday night. Perhaps that speaks to an advantage JJ Redick spoke about prior to the playoffs: these young Sixers don't know what they don't know, and they are at a point in their lives where they can take it all in and enjoy the experience without stressing too much about the moment-to-moment toughness of a playoff game. The years of coming up short, the scars built up (mentally and physically) by taking losses on the chin – none of these hurdles exist for a team on its maiden playoff voyage. So while none of the members of the team are taking the challenge ahead of them lightly or looking past the Heat, there is a calmness in this group you might not expect. That is passed down, certainly, from their best two players. Embiid is the joker, the guy who waltzes out to postgame availability and drags half of South Florida into the Atlantic Ocean. And then there is Simmons, who offers few words and lives "behind the glass" from the rest of us, as Redick likes to say, and outwardly expresses no reservations about the challenges ahead. "My thing is, no one is going to get better overnight. No one's going to be able to jump higher," said Simmons. "It's the same guys we've been playing, and I'll be ready ... I'm not worried about [the physicality]. I can hold my own, and I know everybody on my team can hold their own." This is a good thing, and it is part of what has the Sixers feeling confident heading into Game 4 on Saturday afternoon. They may look like they're here for a beach vacation — many of the Sixers entered the gym Friday in flip-flops, with Dario Saric tilting sunglasses on top of his head like some sort of oversized shoobie — but this is a business trip for Philadelphia. During a sitdown with the media on Friday afternoon, Embiid summed it up best while describing his approach to the series. "I feel like I'm one of the most physical players in the league, I love contact, I love attacking, I love going to the free-throw line," said Embiid. "We just got to come in tomorrow, try to to punch them in the mouth early, and then I think the series is going to be different. I'm excited about tomorrow." That's not just an idle threat or a series of empty words from the big man. From the very beginning of the game on Thursday, Embiid was on a mission to make Miami feel his presence regardless of whether he had the ball or not. He claimed his victim on the game's very first play, absolutely leveling Tyler Johnson on a screen that sent him tumbling to the ground and clutching his hand afterward. Embiid offered up a ton of these in Game 3, in a screening performance that would have made illegal screen maestros like Kevin Garnett beam with pride. This is ultimately a much less flashy contribution than what Embiid offered as a defender and scorer, but it was no less important to Philadelphia's ultimate triumph. Over the course of a game, these plays wear opponents down and make players fighting through screens think twice about trying to go head-on at the largest man on the floor. "We've got a lot of tough guys on the team. Everybody's really tough. [Robert Covington], Dario [Saric] is one of the toughest guys I've ever been around, Ben, and you can see on the court even guys like JJ [Redick], everybody's tough and everybody wants to compete," said Embiid. "That Game 2, everybody kind of got caught off guard. Yesterday, it was much better and we didn't back down." But look at it from a wider lens, and you can see how the Sixers as a unit are making Miami suffer in the screen game. While Miami has been labeled the more physical team in this series and have earned that rep, they also run an offense that is less physically demanding to defend than the Sixers'. Whereas Miami moves side-to-side, the Sixers run players through gauntlets of screens, and eventually the dam breaks. For example, in this fourth quarter set, there are screens all over the place: Ersan Ilyasova on JJ Redick's man (Wayne Ellington), a dummy screen from Embiid toward Dwyane Wade that sets up another screen on Ellington, and a final pindown screen from Simmons on Kelly Olynyk, which frees up the original screener, Ilyasova, for an open three. Keeping track of all this is physically and mentally taxing for defenders, and running sets like these throughout the game helps explain how the Sixers have worn down the Heat in the second halves of games in this series. Brown was peppered with questions about the physicality on Friday, and what seems clear is that his guys are being prepped to deal with a level that is as high or higher than what they've already faced. "When people come and close you out, do you get stood up, or do you sort of, we call it sweeps and scrapes, try to create some level of space? How do you put a forearm in somebody's chest and create a lead so they're not driving you too far out and the play sort of gets watered down?" said Brown on Friday. "[The physicality] is only going to get more ... we all get what's about to happen. Words end up cheap." Should this basketball thing ever flame out, Embiid has a good second career as a wrestling heel waiting for him on the other side. His trolling extends beyond social media, and when he hit his first three against the Heat on Thursday night, he busted out the shush motion in an effort to antagonize Miami's crowd. Embiid, who was booed something fierce in Miami on Thursday night, did not exactly try to avoid that happening again on Saturday. "Those type of things are the kind of ways for me to get back and start playing better because I actually think I play better on the road. I just love the atmosphere, I love looking around the arena at people booing, people going against us, that just takes my game to another level," said Embiid. "I love it. I live for these moments." It definitely helps that Embiid's mask makes him look like a comic book villain, Doctor Doom's mask married with the might of Doomsday. His attempts to inflame Miami players — like when he flashed three fingers at Hassan Whiteside in the midst of his foul trouble — only serve to better carve out his role as the bad guy. Has there been a more valuable player for the Sixers in this series than Whiteside? That question is only half joking. He has been atrocious for Miami, and I'm not sure there's a realistic path toward turning that around for Miami's starting center. We could diagram a bunch of defensive lapses and pouting on the offensive end, but that sort of ignores what the problem is here. The snapshot you're looking for came with nine minutes left to go in the game, and the Heat coming out of a timeout down 10 points. With the way the game was tilting, it was now or never time for the home team. And then Whiteside ambled out of the timeout, and threw an errant pass straight out of bounds. Erik Spoelstra has dodged questions about Whiteside's play and role at every single opportunity during the series, trying to focus on the team's collective failure instead of the actions of one man. But it's really hard to ignore how bad he has been as a neutral party — the Sixers are outscoring the Heat by 17 points per 100 possessions with Whiteside on the court in this series, which is absolutely representative of his individual play. The Sixers have not always been able to take advantage of his lackadaisical approach to defense, but over time someone who is as disengaged as Whiteside is going to contribute to his team bleeding points. In real time, you can watch Whiteside crumbling and the Sixers taking advantage of it. Simmons came up with a key strip of Whiteside early in the fourth quarter in Game 3, and as if he was a shark who smelled blood he went right down main street and forced Justise Winslow to take a foul as Whiteside stood in the paint with his arms by his side. Frankly, one of the only saving graces for Miami over the last two games has been foul trouble artificially forcing Whiteside off the court. Miami's backups actually offer something of substance in this series — Kelly Olynyk spaces the floor and can at least credibly close out on shooters, while Bam Adebayo is an active rim-runner who will mix it up with anyone, even if he's still unrefined skill-wise. That Whiteside has been so brutally exposed in this series does reflect well on the Sixers, however. Where someone like Simmons sets himself apart from the average rookie — or even a lot of veteran players around the league — is his situational recognition. When Whiteside is out there for Miami, there is a much greater emphasis on forcing him to be involved in the play defensively, which more often than not has produced open shots for Philadelphia after a defensive breakdown. If Spoelstra continues to go to Whiteside in this series, there just doesn't appear to be a credible path forward for Miami. It's unlikely he's going to just abandon his starting center, but frankly, it can't go much worse than the current option.